There are plenty of cases of media members being fooled by fake social media accounts, but those accounts usually are impersonating a legitimate reporter, like Adrian Wojnarowski or Adam Schefter. There have been some more ambitious plans at times, though, including fake athlete quotes, fake college recruits, fake websites, and even accounts posing as reporters. 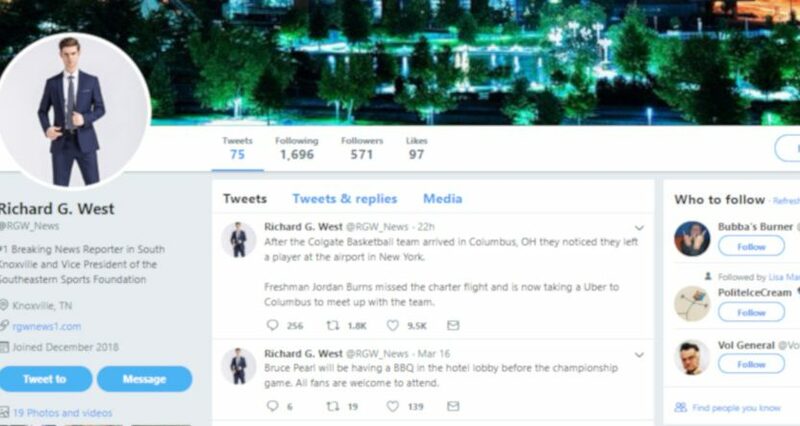 The latest case along the latter lines involved fake reporter “Richard G. West” tweeting that Colgate player Jordan Burns missed the team’s flight and took an Uber from New York to Columbus for their game, and it fooled a lot of people on Twitter, some sites in CBS’ network of local news sites, and even Burns’ own mother. Colgate guard Jordan Burns was in Ohio on Wednesday just as he was supposed to be. In reality, there was no funny business for Burns or the Raiders’ travel from Hamilton, N.Y., to Ohio. (CBS New York/CBS Local) — Colgate sophomore guard Jordan Burns made it to the the airport for the team’s charter flight to its first-round NCAA Tournament game. But he didn’t make it onto the plane. And the team didn’t notice until they landed. So now the sophomore guard is taking an Uber from Hamilton, New York to Columbus, Ohio, where his 15th-seeded Raiders will take on the second-seeded Tennessee Volunteers. The 512-mile trip, under normal driving conditions, should take about eight hours. The game is scheduled for Friday, March 22 at 2:45 ET. Why did this tweet get so much attention? Well, whoever runs the “West” account built up a reasonable-at-first-glance background; their account started in December, their bio (“#1 Breaking News Reporter in South Knoxville and Vice President of the Southeastern Sports Foundation”) feels like something an actual reporter there would use, and they’ve managed to build up 568 followers (likely thanks to following 1,696 people; many people see someone following them whose bio doesn’t look ridiculous and just hit follow without actually checking out their tweets). And the tweet in question here strikes the right balance of interesting but believable; athletes have missed flights and driven to cities before, Columbus is not an unreasonable drive away from Hamilton (especially with the game not until Friday), and there have been some ridiculously expensive Uber trips. If Burns had missed a flight, it would have seemed more logical for Colgate to send him with someone else rather than an Uber, but NCAA schools aren’t always smart with money. So at first glance, this doesn’t necessarily scream obviously fake. The NCAA will be informing LSU of their future sanctions in the next coming days. The FBI wiretaps on Will Wade has also confirmed that he has been paying referee Anthony Jordan. Anthony Jordan has been at the center of several controversial calls at the end of close games this season that went in LSU’s favor. The FBI opens up immediate investigation into the AP Top 25 poll voters in suspicion of bribery from Duke Athletics. Breaking News: After being turned down by Eddie Gran, Kirby Smart will now head to the Miami Dolphins as the Head Coach. West Virginia basketball team will be late getting to Knoxville tonight due to they got on the wrong airplane and ended up Phoenix, AZ.